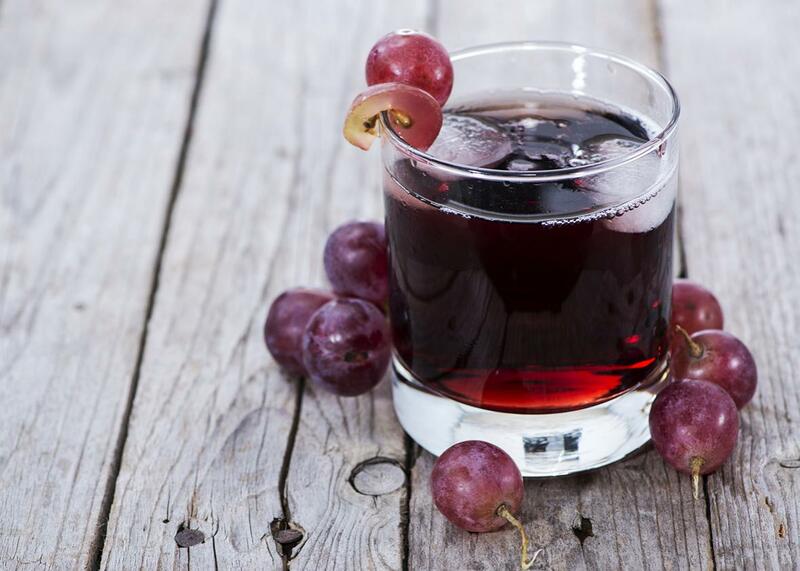 You can’t protect yourself from norovirus by guzzling grape juice. And you can’t stave it off by guzzling grape juice. Not the cure you’re looking for. Dread fills the parent who finds herself cleaning up kid vomit in the middle of night. I know because it happened to me last weekend. It’s not that I hate throw-up (it’s gross, but I’m a mom) or that I can’t handle being summoned at 2 a.m. (Did I mention I’m a mom?) No, the overwhelming fear comes from realizing that it’s probably a stomach bug—and that the clock has started ticking on the cruel weeklong wait to see who else in the family will go down. Last week, due to severe dehydration from norovirus, the virus that causes most stomach bugs in the U.S., friends of mine ended up in the hospital. Their entire family of four. So I totally understand the desire to cling to something—anything—that makes you feel like you’re giving the finger to the norovirus. Since January is peak norovirus month, I was not surprised the other day when I saw an article all over social media titled “The Sneaky Mom Trick That Might Just Help You Avoid the Stomach Flu.” The trick, according to the article, is grape juice: Drink it when norovirus is making the rounds, and you might not spew liquid from both ends of your body ever again. Oh, wouldn’t that be nice. I would drink eight gallons of grape juice a day if I believed it would prevent stomach bugs. (Although I’d have to weigh it against the type 2 diabetes I’d inevitably develop in its stead.) But I have some bad news. There’s no evidence even to suggest that drinking grape juice prevents norovirus. The rationale used by this article—and many others like it—is really quite ridiculous. More importantly, though, noroviruses do not multiply in the stomach: They multiply in your intestines. And when they do multiply, they do so only after they have invaded your body’s cells. So the idea that grape juice is going to wash triumphantly over vulnerable multiplying noroviruses inside the stomach is wrong on two more levels. The genesis of this grape juice idea seems to be a 2012 study published in the journal Applied and Environmental Microbiology. It reported that grape seed extract can break down the outer protein shell of noroviruses, disabling them. This sounded promising, but I wanted to know more, so I called up the first author of the study, Dan Li, a food microbiologist at Ghent University in Belgium. I asked if her study suggests that drinking grape juice prevents norovirus. “I hope I don’t disappoint you too much,” she said, but no. For one thing, grape seed extract is not the same as grape juice. At all. The chemicals in grape seed extract that are believed to harm the virus, called polyphenols, are mainly found in the grape peel and seeds, she says, not in the juice. The second problem is that her study found that grape seed extract applied directly to noroviruses in the lab harms the buggers, sure, but it does not mean that if you drink this extract, it will get to your intestines with the necessary chemicals intact (digestion is harsh!) and be able to harm the noroviruses lurking inside your cells there. Her study was not designed to identify foods people could eat to stave off norovirus, but rather to find chemicals that could be administered directly to foods, food surfaces, or processing water to decontaminate them. Finally, Li pointed out that her team didn’t use real human noroviruses in their study because they are notoriously difficult to grow in the lab. Instead, they used “surrogate” viruses, which she says may differ in important ways from the ones that infect us. But, you say, what about all the stories on the internet from people who guzzled grape juice and never got sick? Ah, the power of anecdotal data and reporting bias. There are other biological factors that affect susceptibility to norovirus, including blood type. So not everyone who gets exposed gets sick, which leads people to attribute their luck to anything they want. Let’s say 100 people drink grape juice in the hopes of staying healthy, and 80 of them get sick while 20 don’t. Those 20 will be convinced that the grape juice saved them and will scream it from the hilltops, even if they resisted the virus for other reasons. Those other 80? Most likely you won’t be hearing from them at all (except perhaps some groans emanating from the bathroom). One small caveat: There is some research, mainly from the 1970s, suggesting that fruit juices can kill viruses. Again, though, this research shows that applying juice directly to viruses in the lab can harm them, which doesn’t mean that drinking these juices will keep you healthy. As the authors of one such study from 1978 conceded, “the importance of these foods as natural antiviral agents seems to depend on the stability of these complexes during passage through the digestion system.” Nearly 40 years later, we still don’t have evidence that juices can do this. What does work: plain old bleach (5 to 25 tablespoons per gallon of water), Lysol disinfectant spray, and Clorox Healthcare Bleach Cleaner disinfectants or Clorox Hydrogen Peroxide Cleaner disinfectants, which you generally can’t find in grocery stores. (I buy them online and use them to wipe down bathroom surfaces and doorknobs when someone is ill.) And although soap doesn’t kill noroviruses, washing your hands will eliminate the jerks if you do it for at least 20 seconds. Bottom line is this: If your kid or partner gets a stomach bug and you want to (try to) stay healthy, wash your hands, put the grape juice away, wash your hands again, and reach for the bleach.